Who earned the CCLP designation this year? You can apply for the Senior Executive Fast Track—an accelerated version of the CCLP-bound program of study for senior executives who have been at the director level (or higher) for 10+ years. 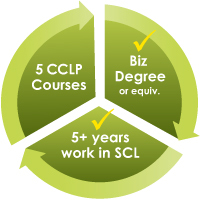 This is the first course in CITT’s CCLP designation-bound course suite. We recommend you do this as soon as possible to get your exemptions credited and avoid any delays in receiving your designation. You can apply online for the Senior Executive Fast Track here. You'll need to submit a copy of your current resume and the $390 (plus tax) fee. Or click here for more information about CITT's Senior Executive Fast Track. Click here to register right away! Once you've completed Transportation Systems and Logistics Processes, you can take more than one logistics course at a time to complete the program faster. Every CITT-Certified Logistics Professional has completed this suite of industry specialized courses. This guarantees a national standard of understanding and gives professionals knowledge that is portable throughout their career progression. Even more senior people who’ve worked in the industry for over a decade have reported that these courses have helped them pick up a new depth of understanding to help them design or manage stable, uninterrupted and profitable supply chain operations. If you have any questions we didn't answer above—or if you'd like help getting registered—CITT's staff are available to support you. Contact us at info@citt.ca or 416-363-5696. We're here from 9:00 am - 5:00 pm EST, Monday through Friday. Please send me more information! Honorific Mr. Ms. Mrs. Miss Dr. Hon. Please have someone contact me with more information AND add me to the CITT mailing list with the latest information on professional learning and certification opportunities in supply chain logistics. Please contact me directly with information about CITT's professional learning and certification opportunities in supply chain logistics, but DO NOT add me to a list of continuing communications from CITT at this time. Your contact information will never be sold or shared for any other purpose other than what you have authorized. And if you agree to be added to the CITT mailing list, you can unsubscribe at any time. SImply select the "unsubscribe" link at the bottom of every email or contact the CITT office and ask to be removed.